Just like working out to build a better physique, the Sacrament of marriage also grows stronger when we exercise our marriage muscles. But it helps to have a solid understanding of what marriage is in the first place before you dive into trying to build up something you don’t fully understand. The reason for such an extreme definition of marriage is because marriage plays a key role in God’s plan of salvation. The creation of man & woman is in God’s very image and likeness and God Himself is the author of marriage. The vocation TO marriage is written into the natures of man and woman. A healthy marriage contributes to the well-being of its family which contributes to the well-being of society and to all the individuals in it. Even cooler, marriages aren’t just witnesses for other marriages. Marriages are witnesses to all humanity of the everlasting covenant established by Jesus Christ. When man and woman give and receive love with each other in marriage, this mutual love is the image of how God loves man. In this episode we dive more deeply into how everyone – including single and widowed people, as well as religious, are affected and dependent upon marriage. Plus we discuss the core of what makes unexceptional marriages, and the four key steps to building marriage muscles. NOTE: Our Exceptional Together online course is filling up and registration closes on MAY 14, 2018! 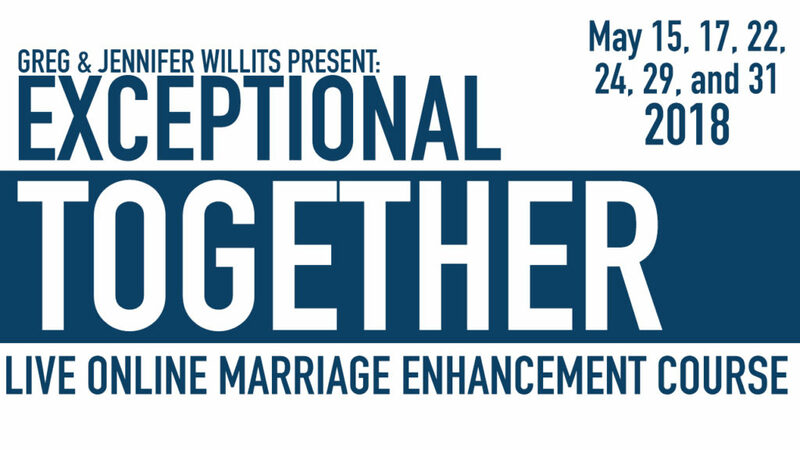 Be sure to visit ExceptionalTogether.com to save your spot now!